Brain Inspired Photonic Processing is a collaborative research project funded under the call OH-Risque of the French funding agency ANR. It has started on July 2015, for a first exploratory phase of 2 years (if successful, a second phase of two years will be following). 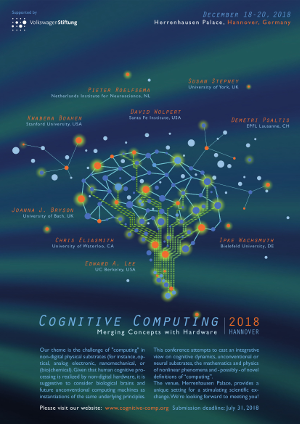 Its objective is to demonstrate the hardware demonstration of a novel brain inspired computing concept, Reservoir Computing, recently explored experimentally via time delayed feedback nonlinear dynamics. The latter high complexity dynamical systems can be implemented physically (demonstrators have been recently achieved with optical devices, as well as with FPGA digital boards), thus performing a dedicated hardware emulating a kind of neuronal network capable for executing complex calculation tasks. The project proposes to solve two real life complex technological problems: Diagnostic and Prognostic of a promising green electrical source of energy, Fuel Cell; And real time control of the beam shaping in advanced nano-machining femtosecond lasers. The project is a strongly interdisciplinary one, involving physicists, optic and electronic engineering researchers (FEMTO-ST @ Univ. Bourgogne Franche-Comté, and FCLAB a CNRS research federation), as well as mathematicians (LMB @ Univ. Bourgogne Franche-Comté, Univ. Sankt Gallen, Univ. Konstanz). This project is also part of the DEMO 3 within the Labex ACTION project (laboratory of excellence, funded by the ANR). Several participants of the project are members of the CNRS GDR BioComp, a national research group animating the French community working on Bio-inspired Computing approaches.